$37,850/Year for Just 1 Sale/Day! Spend 5 Minutes to Earn UNLIMITED MONEY! IMPORTANT: Read ALL this page to maximize your earnings! It takes just a few minutes to put your affiliate link "out there". Then earn up to $125 for every referred sale. First 1-4 sales per month earn $50 per sale. Next 9-12 sales per month earn $100 per sale. 13 or more sales per month earn $125 per sale. Just 1 sale per day gets you $37,850 a year! Make 10 sales per day and earn $442,800 per year! Put your link "out there" to help others by promoting this course that other people need. Put it in the footer of all your outgoing emails, Twitter posts, Facebook pages, Youtube, blogs, websites, even business cards or flyers to pass out at the courthouse where everyone you meet will be interested in this course and order using your link if you convince them of the course's value to them. Four out of five people you meet cannot afford a lawyer. That's more than 250 million people in this country! They are your customers! Help them! Tell them about this course using your link and earn money for helping them! Four out of five people you meet at the courthouse need this course. Sell them! Tell people the power they will have to win when they CLICK YOUR LINK AND ORDER. Our server will see your code in the link and remember your code when your customers order. If they come back later to buy, our server sees a cookie we set on their device (if they allow cookies) telling us they were sent by you, and if they order you will be paid your commission when they order from your link. You receive an email each time someone orders from your link. Commissions are paid the first of each month. Hide your affiliate link in eye-catching graphics. Here's one to try. Hover your mouse over it to see your our test code ZZ0001. Go ahead and click it. Our site will open in another window. (Come back here by simply closing that window.) Scroll down in the window that opens and see that the page was referred by our test code ZZ0001 that will appear on the right side near the bottom (just as yours will when you set this up for yourself). Any image will do. If you don't know how to hide a link in an image, Google "add hyperlink to image" for articles explaining how. Here's an even better image. Hover your mouse over it to see our test link embedded right in the image. You can copy-and-paste this image (right mouse-click options) to your outgoing emails, social network sites, or any website where you have posting privileges. You can hide your affiliate code behind words, too! For example. Hover over this link to see our embedded test code ZZ0001 or click it to test. 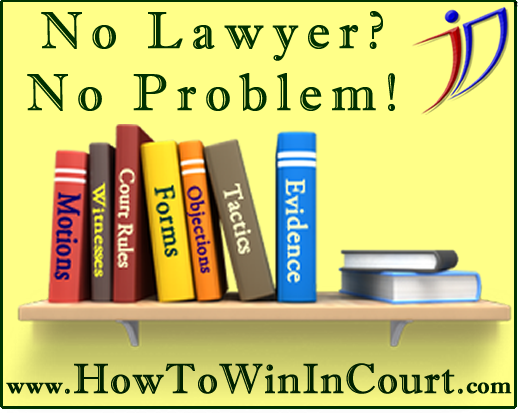 Click HERE to get the world's best "How To Win In Court" self-help course! I tried it myself, and it showed me how to win! Put some words around your link telling people "WHY" they should click and order the course! Tell them the VALUE of learning "How to Win in Court". Explain "WHY" they should click and "WHAT" they will get. Urge them to CLICK your link and ORDER the course. Tell them what they'll miss if they don't. The more people who see your link then CLICK AND ORDER, the more money you make each month. Take a few minutes now and start earning commissions today while helping others in need of legal knowledge, people who cannot afford to hire a lawyer, people who will order this course from your link if you convince them of its value! IMPORTANT: Before putting your link "out there", send it to yourself in an email to TEST YOUR LINK. When you receive your email (Yes, you can send yourself emails.) click your link in the email. This should take you to our site. Then scroll down and look for your code on the right side of the page near the bottom. Remember: your code is the first initial of your last name, first initial of your first name, followed by 4 numbers UNIQUE TO YOU. If you don't see your code (or don't reach our site when you click your link) then your link is not formatted correctly. Fix your format according to the information above then send your link to yourself again in another email, click it, and continue testing like this until you see your code on the right side of the page near the bottom. When you do see your code you KNOW your link is working and that you WILL be paid commissions for ALL sales from other people who click your link and order the course from your link. For more help, send an email to sales@Jurisdictionary.com. * All commissions are paid through PayPal, so be sure to have your PayPal log-in email address on file with us so we can pay you promptly. Thank you. NOTE: We do not pay commissions to people who use their own link to order for themselves or someone in their own household. Our server will catch these, and no commission will be paid. Commissions are paid only for sales to other people that you want to help.